For 26 years I had the best seat in the house – often in the center of the stage, frequently in the spotlight, always in the clear view of conductors and the audience and constantly amid the passions that come with making good music. This is the story of how I got that seat, of many of the highs and a few of the lows that come with sitting there and of some of the wonderful people who shared my journey. 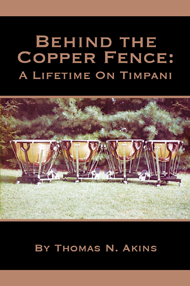 Here are the details behind the creation of William Kraft’s Timpani Concerto Number One, the mystery of being honored with a titled chair, the fun of playing on the ISO’s softball team and the benefits of studying timpani with Freddie, Eddie and Dan. Carnegie Hall became a special place, conductors from Richard Lert to Henry Mancini earned my respect and I had an insider’s view of the major leagues of orchestral music. Away from music, I led another life as a sportscaster, broadcasting games and interviewing many of America’s finest athletes. A little of that slips into these pages, too. There was never a dull moment Behind The Copper Fence.